Combining into one body the merits of friction-engagement and multi-step tooth-engagement, ARTICOUPLE FR is a universal-use, hydraulically operated, articulate coupler capable of assuring a superior seaworthiness and, in addition, adapting itself to change of draught due to dumping load of dump-barges as well as loading and unloading of cargo barges. Connection by means of ARTICOUPLE FR-coupler can take place at any arbitrary draught relationship in a very short time by remote-control from the bridge of the pusher, and the high degree of time- and manpower-saving combined with the excellent seaworthiness can assure a high operational economy in rough sea. Couplers of ARTICOUPLE FR-Series are classified into two sub-series --- deck-mountable FRD-Series for small- and medium-sized pushers of flush-deck type and forecastle-side mountable FRC-Series for medium- and large-sized pushers of long-forecastle type. The Connecting Pin supported by the Main Bearing fixed to the hull is extended out by the function of a main hydraulic cylinder in its inside so that the Pressing Shoe mounted at its end may be inserted into the Connecting Slot of the barge. The hard rubber lining on the forward and rearward faces of the Pressing Shoe are pressed onto the corresponding walls of the Slot to generate strong friction preventing vertical slip of the Shoe. This stage is called F-Connection. Then. the Connecting Pin is slightly retracted to loosen connection and a wedge-shaped Rack Pin is extended out from the hole in the Pressing Shoe by the function of a sub-cylinder so that it will engage into the teeth of Rack in the Connecting Slot and, immediately after, the Shoe is pressed into the Slot again. This final stage is called R-Connection. The transition from F-Connection to R-Connection is automated. 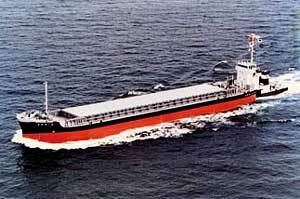 ---Articouple FR can assure an excellent seaworthiness assuring ocean service of pusher-barge trains. ---Articouple FR can connect the pusher to the barge, without previously adjusting the draught, at any point within the whole range of draught relationship. ---For connection and disconnection, Articouple FR is remote-controlled by the captain's finger-tip from the bridge and no muscle work is needed. ---Connection and disconnection works are made from the pusher only and the crew members have no need of going over to the barge before connection. ---Relative pitching between the pusher and the barge is left free, while other relative motions are perfectly stopped. The crew members on board are free from shocks, vibrations and noises during connected navigation. ---Connection by Articouple FR can take place without difficulty even when a slight relative heel is found between the pusher and the barge, and even under a certain influence of waves. ---When pushing a dump-barge, R-connection is changed to F-connection and the connecting pins are slightly retracted to keep two watercraft in "loose connection" before dumping down the load. When the load is dumped down, the barge will rapidly float up. Then, F-connection is recovered by simply extending the connecting pins and, then, R-connection by the transition process. --- During loading and unloading of a cargo barge, the coupler is kept in F-connection and the above-mentioned loosening and re-connection are repeated at proper time intervals under automatic control to adapt the pusher draught to the gradual change of barge draught. ---The outer surfaces of pressing shoes are lined with hard rubber which will generate strong friction. If the pusher is frequently operated in rough manner, re-lining may be needed after about 2 - 3 years, while the life is much longer when the manner of operation is not rough. ---When converting a harbour tug to a pusher boat by addition of an Articouple FRD-coupler, the coupler main bodies installed at deck sides just abaft the windlass will not cause any change of the bow contour nor project beyond it and the function of the boat as a tug can be maintained even after conversion.